[Event Notice] Lottery for Macky Ozawa Magic Show (Maruhiro Department Store Kawagoe)! At the request of many customers, the lottery application deadline has been extended until 2 AM. We are awaiting everyone’s applications with anticipation! Some of the selected persons could not be reached by e-mail. Hashimoto, Tateishi, and Kuji have been selected. We extend our sincere gratitude to all of the overwhelming number of applicants. In accordance with the results of the lottery, we have contacted all of those who were selected. Though we make no promises for those who were not selected, for the sake of those who go shopping at Maruhiro Department Store Kawagoe on that day, same-day seating will also be prepared. We’ve done it again this year! Seikatsu Kakumei’s Fall customer appreciation event. This year, as we’ve launched our Pepper business, we’re making the topic about Pepper. 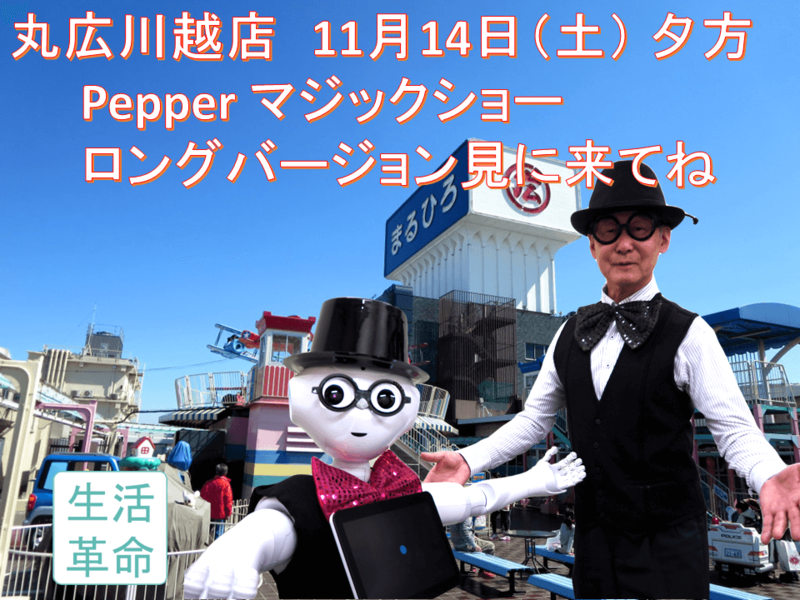 On Saturday, November 14th from 4 PM at Maruhiro Department Store in Kawagoe, the world’s first Pepper-focused performance between magician Macky Ozawa and the humanoid communication robot Pepper, actually the world’s first robot magic show’s second showing will be held! In addition to the first magic show which was announced at Robot Saitama, a new and even more enhanced Pepper magic illumination show will also be showcased. You won’t have many chances to see a Pepper magic show live! In the day’s spirit of gratitude, for the thrilling premier of this show, we would like to give priority invitations to all of you who read our company’s blog and Facebook. Please fill out the necessary details on the application form and apply. The application form is here:http://goo.gl/forms/Z0gkTq7kRF (the deadline is 9 PM on Friday). We will be awaiting a large volume of submissions! *We will notify winners of the lottery results by Friday at midnight. *Even if you are not selected, same-day seating will also be prepared. 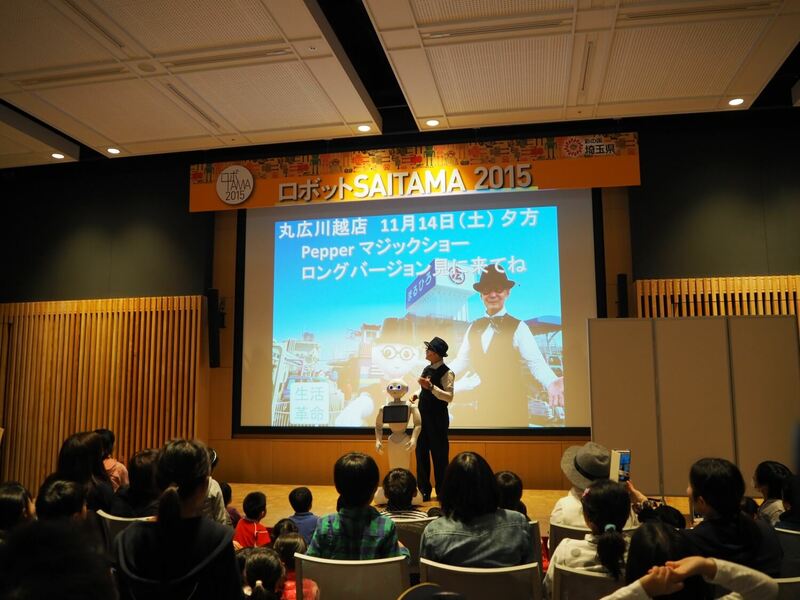 Our magic show showcased on November 3rd (a holiday) at Robot Saitama 2015 at Wester Kawagoe was also quite popular. Beyond our magic shows on November 14th and 15th, at Maruhiro Department Store Kawagoe, Pepper will give a sales demonstration of year-end gifts. Please be sure to also watch Pepper working at a department store! At Seikatsu Kakumei, we do planning, operations, and rentals for events using Pepper and other robots. The Pepper robots we offer are a little different from the others! ← [Event Report] Okazaki City Tourism Expo Was a Great Success!